One of the things I really enjoy about this blog is the opportunities I get to talk to some of the superstars of fly fishing. I’ve interviewed photographer extraordinaire Brian O’Keefe and the mastermind behind The Drake Tom Bie. My latest interview is no exception. Marshall Cutchin started out as a reluctant fishing guide in Key West who eventually became one of the key’s pioneers. Seeking a change of pace, Marshall moved out west to Montana and then eventually to Colorado where he started Midcurrent.com, the biggest fly fishing Web site on the internet. Today, he’s started a new project, Skiff Republic. With Midcurrent, you've created the grand-daddy of fly fishing Web sites. You've got a new web site that I think is just brilliant and that is Skiff Republic. Can you tell me how Skiff Republic came to be and what's your vision for it? Midcurrent is a gigantic beast that requires constant feeding and tending that requires 7 days a week and a 12 hour a day job. I was toying with the idea of taking with what I’ve learned with Midcurrent and turning into something fun and Skiff Republic seemed a logical thing today because even after 15 years of being out of guiding I still at least once a week dream of driving my skiff around. I love small boats and what they can do. It takes years to understand. Learning how to take a boat to a place in all kinds of weather and position and pole the boat by itself is a fascinating thing. Skiff Republic is a new thing that I wanted to do for fun and see where it would go. There still isn’t a place where newbies can go and learn about skiffs and what you should be looking for. With boat design, you have continuity of what people have tried to do and materials have changed. 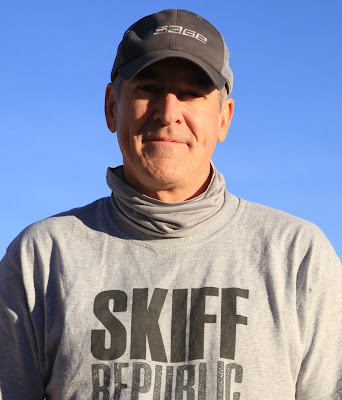 Have we hit a wall in skiff development? Do you think they can get much skinnier, quieter, and better than what is out there now? It’s in some ways parallel with what’s happening with fishing gear and rod and reel development. There are a lot of people who have favorite boats and rods from 20 or 30 years ago who think they are better than what is coming out today. In my own experience, I’ve had four different brands of skiffs. My first was my favorite. A lot of time skiff manufacturers will do something that doesn’t improve performance. There’s no question that what happened with resins and fusion and vacuum bagging was a game changer in skiff design. If only because it allowed manufacturers to come out with consistent designs, not everything was hand laid. New materials could be introduced. Whether the hulls or not they get skinnier depends on engine design. The shift from two-stroke to four-stroke added weight to the boats. There are people thinking beyond what is out there and customizing their own skiffs. You have the Cadillac’s out there like Hells Bay and Maverick, I'll lump in Dolphin. What about these companies like Ankona and Skull Island who are building more price point skiffs that are getting good reviews? How do you foresee these boats changing the game, if at all? I think it’s healthy for the market to have people passionate about building skiffs for the masses. There is no question you can build skiffs for less money just because of the evolution of technology and design. The knowledge is not that hard to get anymore. The guys building the boats in the 60’s, 70’s, and 80’s were inventing as they go along. Now you’ve got a culture that is pretty well educated. The longer term question is can these new designs survive from a business prospective. Initial runs are advertised as affordable but as demand goes up price goes up. There aren’t a lot of skiffs sold each year. Companies are trying to stay cash flow positive. No one can blame them for staying cash flow positive. If you had to build a boat like this yourself, you’d spend a heck of a lot more money trying to build one. There’s room on both sides of the scale for up-and-comers and for companies like Maverick who have seen it all. Many people know you as the founder of Midcurrent, but actually you were one of the early fly fishing guides in the Florida Keys. How has the guide business changed over the years? The biggest change happened while I was still guiding, at least if you’re talking about guiding in the Keys. When I started guiding, expectations were pretty low. There weren’t many guides around. I was convinced to get my Captains license by someone who asked me to help take overflow from Tarpon season. Five years later the demand grew dramatically. You went from having half-a-dozen full time guides in the keys to upwards of 40 or 50 guides in the lower Keys. The Keys in general went from 40 or 50 guides to over 300 guides in the Keys. It became a cool thing to do and attracted a lot of kids, and I was a kid, I started guiding at 25. I think probably the biggest change is that it’s harder for guides, unless they are veteran guides with a solid reputation, to make a good living as a guide. It’s people’s imagination about being a guide as being pretty romantic that you’re out there fishing everyday and making $400-500 a day. If you’re going to be a good guide you’re committing to going out there when no one else would be out on the water. If you are going to commit to being a good guide, you are committing to your clients to be a part of their lives. They are booking you a year in advance and in sometimes in perpetuity. You're put in very close situations with your clients. It’s not the fantasy world that a lot of people imagine. But on the other hand I look back at the 11 years of my life as a guide and it was the best years of my life. What was your first skiff and what's the biggest change in skiffs since that boat? The first skiff I owned was one of the earliest Action Crafts. It had sloped gunnels that were influenced by Stu Apte. I was the third owner, I believe Stu owned it first, then a gentleman in Fort Myers, and then I owned it and ran it for a year and a half. Then I bought an early Hewes Bonefisher. This was the first year it came out without wood and with Kevlar. Had a huge engine on it because I was 26 years old and I wanted to be the fastest on the water. I went through that phase and realized I didn’t want a huge engine to be poling all day. Then I moved to Maverick HP which later turned to Maverick HPX and HPV. When you were guiding, what was a typical day like? Well, I don’t know that there were any typical days. There were days that there was no amount of money worth going out in and there were days I couldn’t believe I was getting paid for doing what I was doing. Very rarely was the weather consistent where you could settle into a pattern. The times when you got comfortable and you convinced yourself that you had it figured out something would happen and everything would change. The key skills that good guides need are flexibility. When you’re fishing at your best you have no idea where you’re going to go. You didn’t know where you are going to go until you got to your destination. Then we had a chance to look at what the conditions looked like. For me I would get up at 5:00 or 5:30. Get the boat fueled up, ice, meet the clients typically at 7. After the first few years I wasn’t one of the guides who had to get out before sun up. In a given day I was fishing a lot of different spots. I’m kind of inpatient, I don’t like sitting in one spot too long. I would fish minimum 6-8 spots a day fishing the spots. Come home clean the boat and do it all over again. If I had a day off, all I could think of was where the fish would be. How often do you get to Florida and do you still have a skiff? Do you fish there with a guide now or go out on your own? I get back once or twice a year and at the moment I don’t own a skiff although I’m on the verge of owning one again. By the end of the year I’ll probably have one down in Key West again. I usually go out with friends and prefer to pole rather than fish. I really enjoy teaching others to fish. It’s a lot of fun for me to take out old clients. My son and daughter are getting to an age when they are starting to enjoy it. I heard in a previous interview you did that Jose Wejebe was guiding at the same time as you. With his tragic passing this year, do you have any good stories about Jose that you would like to share? He had been guiding for 6-7 years by the time I got into it. He was a veteran by the time I started. He was one of the younger guys down there. When I asked people who were the really good guides, his name was one of the two names that came out. In my mind there were two classes of guides: the guys who would stake out and wait for fish and guys who understood that the real challenge was poling after fish. Guys like Steve Huff, Jose, and Harry Spear realized the real excitement was poling boats and poling hard. I got excited hearing about these guys poling after 20-25 fish, poling back around and getting into these fish again. The other aspect is that everyone gets competitive down there. You’re always trying to outmaneuver the other guides. I learned quickly to be respectful of everybody else. I do remember a funny story about Jose asking me about running over his fish in Archer Key Basin. He went on and on and on about it. He was a little crazed about it. I told him I was fishing in Pine Island that day and he said “oh.” But Jose was a really gifted guide. He could fly fish with the best and was good at every kind of fishing. Tom McGuane is listed as a contributing Midcurrent editor. I think his writing is just brilliant and in terms of writing he's certainly someone I greatly admire. Did I read somewhere that you used to guide him? Can you tell me a little about your relationship with him? I met Tom in the 1980s and he was not a client but he did become a client. We fished at least once a year. I developed a lot of friendships in Montana and got to know Tom and we became pretty good friends. When I decided to quit guiding I decided to go out to Montana. I have a couple funny stories about Tom. The first day we ever fished together we went west of Key West. By 9:30 in the morning we had seen a few permit and he then caught one. After we released the fish he said “What do we do now?” I said, “What do you mean?” "Well usually if we catch a permit that’s considered a day." I said, "No no, we’re going to catch more." Had McGuane, Jim Harrison, and Jimmy Buffet left Key West by the time you came on the scene or were they still part of the action? All the guys had a love hate relationship with Key West but by the time I got there they had burned out of Key West. Some of that had to do with the extracurricular activities. They went through a decade where they didn’t want much to do with it. As they matured they came back to it with a different perspective. Tom has an off and on relationship with Key West. He really loved the fishing aspect of it as much as the lifestyle. If I called Tom up today and said lets go fishing in Key West he would say when. Which writers do you really admire? I read a lot of non-fishing stuff. One of the problems these days is I have to read fishing so much. I read 10-15 hours of fishing writing every week, if not more. When you’re forced to do that, you tend to reach outside for other writing. Of the writers of the past 25 years if I had to pick: McGuane certainly. Anything Jim Harrison writes about fishing and food. Jim Harrison’s poetry is really underappreciated and it’s too bad he can’t write poetry full time because it’s phenomenal. Anything written by Russell Chatham I think is worth reading. He wrote some wonderful stuff in the 70s and 80s. Guy De La Valdene is a fantastic writer. He doesn’t write a lot of fishing stuff now but occasionally does. Nick Lyons is a fantastic writer and editor. He’s done really incredible things to get fishing writing published and out there. There are a whole bunch of guys who have their own followings that deserve attention too that I can’t think of all their names: Ted Leeson, Carl Hiasson, Jim Babb, John Gierach. Along those lines, which writers in the fishing genre are you following and/or who are the up and comers? Writing as a business is almost nonexistent anymore. By that I mean not that there aren’t people who are writing great stuff, and I’ll just use Scott Sadil is an example. Here’s a guy who’s an incredibly talented writer but his chances of making writing a full time career are difficult. You have people who are doing it in the form of a blog or in books once every two or three years. If Scott continues to write about fly fishing he’s going to write some really great stuff. Three or four blog writers I read intermittently. Mostly because they are breaking the mold a little bit. Blogging went through an angry “I’m better than you phase” where people started beating up on others. I don’t consider most of those writers very good. Erin Block, Matt Smythe (Fishing Poet). Miles Nolte at Grays Sporting Journal is talented. The biggest challenge is how do you find the way to do it. Magazines are going away because advertisers don’t want to pay. The landscape has changed and changed the way we write and why we write. Are there skiff companies that you're really keeping your eye on? What should we look for in the future? I think they are all interesting. An obvious example is Ankona and East Cape. Two young companies with similar ideas: Let’s produced some really great skiffs for not too much money. The question is can they continue to evolve and be exciting or do they saturate the market and sell to mostly their own customers and wonder why they’re doing it because they’re not making much money. Harry Spear and what he’s doing. He has the ability to build the perfect skiff because he has the experience of guiding. It will be interesting if he can pull it off. He really understands fishing. What's the future look like for Midcurrent and Skiff Republic? Our audience keeps growing on Midcurrent. I take that as a sign that we are doing something right and need to be thankful for what we have done. We will keep going forward and trying new things while staying aware of changing technology. I'll give you a specific example. Three years our mobile audience was below 5 percent. Now it’s about 30 percent and the growth has changed in the past year. It doesn’t change the kind of thing we are doing but it suggests the kind of thing we need to be thinking about what people are doing 2-3 years for now. The way our home page looks for example. The trend toward video and imagery has changed from 6 years ago when a page was focused on text. In the future it’s going to be heavily video. For Skiff Republic? Who knows, I’m trying to have fun with it. I’m trying to have fun with both Midcurrent and Skiff Republic, but Midcurrent is much bigger. My to-do list is huge right now with Midcurrent. You try to have fun. I realized a while ago I would be working when I’m 85 years old and that I better have fun doing it. Great to see Marshall get interviewed for a change! Good stuff from a good guy.